Are you getting confused in SEO and SEM, or baffling in choosing them for your business? Don’t worry; You are in the right place. In this article, we are going to explain clearly what is the difference between SEO and SEM, which will suit your business, etc. Nowadays, SEO (Search Engine Optimization) and SEM (Search Engine Marketing) are more valuable and effective marketing techniques resemble to be alike both are blended towards generating traffic to the website. However, when we look at the terms deeply these are the utterly different traffic generation method. Let’s take an in-depth at SEO and SEM. Actually, SEO is a component of the larger category, SEM. SEO is the process of increasing the number of visitors to a particular website by assuring that the website appears high on the list of results delivered by a search engine. Besides, the SEO industry is frequently changing due to the various changes made to Google’s algorithm. However, there is one perspective of SEO that stays constant: SEO is made up of On-Page & Off-Page activities. What Components Does SEO Include? As we said above, SEO is involved in two different activities. Including selective keyword naturally into title tags, meta descriptions, heading tags, alt text, etc. Clean and formatting page URLs. Adding canonical tags, and etc. Search Engine Marketing(SEM) is a form of Internet marketing that included the promotion of websites by improving their visibility in search engine results pages (SERPs) through optimization & advertising.” It also includes SEO tactics and some other search marketing tactics. What Components Does SEM Include? SEM covers the use of paid search, such as pay per click (PPC) listings and advertisements. Most of the time, SEM strictly involves PPC campaigns and activities, but if you utilize SEO and paid search, that falls under SEM efforts. 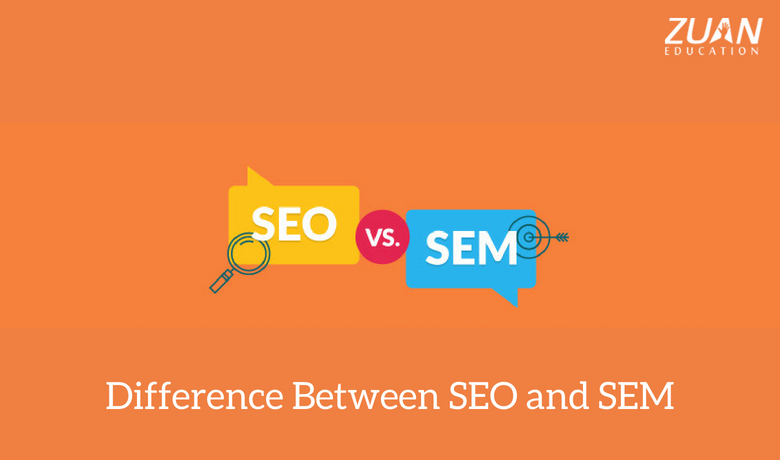 What is the Key Difference Between SEO and SEM? SEO(Search Engine Optimization) has traditionally been thought of as a part of the umbrella term, SEM(Search Engine Marketing), containing both paid AND organic tactics. Now, SEM is used to refer exclusively to paid search. According to Search Engine Land, SEM is “the process of increasing website traffic by acquiring ads on search engines,” while SEO is defined as “the process of getting traffic from the free, organic, editorial or natural search results on search engines.” However, SEM is expensive and SEO is a cost-effective technique. Hence, it’s more accurate to view SEM (paid search) and SEO (organic search) as different entities to use as a component of your Search Marketing arsenal. Once you begin considering SEO vs. SEM, it’s essential to keep your desired results in mind. Both are means of attracting clients and use very different tactics. SEO turns around a focus on making your company’s sales website in line with what search engines want. Google and other major search engines are involved with delivering the top content to users, and they tend to feature websites with clear navigation & easy-to-understand benefits for the users. SEM relies on generating quick, clear advertisements and bidding on keywords that considered customers will likely enter into search engines. Organizations that focus on SEO vs. SEM should keep in mind that the benefits of both include improved conversion and CTR. SEO & SEM should work cohesively in a united effort. Using both SEO and SEM for your business is not only important but it will benefit your campaigns immensely, and helping drive more traffic to your website. When utilizing both SEO and PPC, you can implement A/B testing with paid keywords before committing them to your organic goals to estimate their effectiveness. Marketers who link both their AdWords and Analytics accounts are able to see the value of their efforts and the corresponding balance these two sides of marketing can create together. Having the balance of both leaves you and your website with a sense of security as both efforts support one another. Both SEO & SEM come with their own unique challenges. It does not always come down to cost or time either. Although, both have challenges related to quality, strategy, and more. Accordingly, what are some of the challenges that occur with each? With both SEO & SEM you are probably taking visitors back to your website. Of course, there are ad types for sending calls and visitors to a physical location, a website is still important. For SEO your web page is certainly important for both ranking & getting users to do what you want. For SEM your web page is essential for getting people to your call to action to convert into a lead. In both cases optimizing each page of your website for conversion is vital to the success of SEO & SEM. You should always keep your landing pages to be effective, have a clear focus, and a clear goal. Utilizing your homepage as the landing page is an inevitable way to fail, especially with SEM. So, Which is Best? SEO or SEM? SEO as a requirement for high-quality SEM. SEO sets the foundation for SEM through well-optimized content that prospects and consumers find helpful. Without landing pages, and blog content optimized for search, your search engine marketing efforts will fall flat due to inadequate quality, and visibility in the SERPs will be much difficult. Besides, organic SEO is also less costly long-term as you establish search credibility, as long as you keep it with the consistent creation of quality content and social media usage. But if you are just launching your first website and initial online footprint, you are probably going to need some instant visibility in the search until you build up some organic credibility. With a strategic PPC campaign, you would be able to achieve this. So in a nutshell, SEO features on organic search results or reaching the top position on the list when a visitor searches keyword on search engine related to your website. On the other hand, in SEM the emphasis is on picking the appropriate keyword to invest advertising money so that the ad would look in the paid search results. Hence, evaluate what’s best for your particular needs but make sure you fully understand the differences and how you will maintain your efforts long-term.